Niaspan is an extended release oral form of niacin and is used to reduce cholesterol by lowering the blood lipids known as triglycerides. By lowering this very low density lipoprotein form of cholesterol, it can help reduce cholesterol overall. Oral niacin, which is the active ingredient in Niaspan, actually lowers the production of triglycerides which lowers low density lipoproteins (LDL) and raises the good kind of cholesterol which is the High Density Lipoprotein (HDL). The combination of lowering the bad and raising the good, improves the ratio between the two, and reduces cholesterol effectively. This drug is also often used with other types of cholesterol lowering drugs, but the two doses must be separated by at least 6 hours. Niacin can be found in over the counter supplements because it is just a B vitamin not requiring a prescription. People should be cautioned, though, that an imbalance in B vitamins including too much niacin can cause liver damage and other health problems. Niaspan is formulated in a way that reduces that risk. Other side effects of Niaspan include a flushed face and itching, higher blood sugar, and a wide range of gastrointestinal problems. This could be anything from nausea to severe diarrhea or vomiting, both of which can lead to dehydration. To prevent some of the side effects, or lessen the severity, patients can start on low doses and gradually increase the amount. A good way to get the impact of niacin in a balanced and natural form is to eat foods rich in B complex vitamins. The balance of B vitamins is kept in check when a variety of foods round out a low fat, low cholesterol diet. 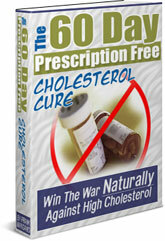 To learn more about how to reduce cholesterol through dietary choices, get The 60-Day Prescription Free Cholesterol Cure.